New, never used or installed. MODEL# BP350. ATX 12V v2.01. BOX HAS STORAGE WEAR. Antec Basiq 350-watt Power Supply (BP350) NEW! Antec Basiq 350-watt Power Supply (BP350) NEW!. Condition is New. Box has wear from storage. See pictures!! Trending at $41.49eBay determines this price through a machine learned model of the product's sale prices within the last 90 days. 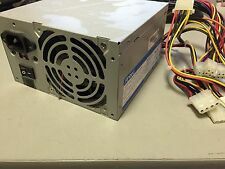 Antec BP350 Power Supply 350watt TESTED . Condition is Used. Shipped with USPS Priority Mail. Trending at $9.99eBay determines this price through a machine learned model of the product's sale prices within the last 90 days. We will respond promptly to your inquiry. Item is used and in good condition. Item appear as pictured. Part #: BP350. Manufacturer: Antec. Before we list an item we power test it if it requires power, if it is a motherboard we test it while in the system before dismantling, if it is a peripheral device that we can test on or in a system we do. 3.3V, 5V max load: 130W; 12V1, 12V2 max load:276W. DC Output 5V 12V, 12V, 3.3V -12V 5V SB. Model:'BP350. That's why Antec took its years of experience and knowledge in building world-class power supplies and made Basiq. Size:'350 Watts. Dual 12V outputs provide maximum stable power for the CPU independently of the other peripherals. Antec Basiq 350-watt Power Supply (BP350) NEW FACTORY SEALED. Condition is New. Includes power supply, power cable, screws and instruction manual. Shipped with USPS Priority Mail. Antec BP350 350W Basiq Power ATX 12V Desktop Power Supply TESTED! FREE SHIPPING! NEW Antec Plus 350 Watt Atx 12 V Power Supply BASIQ. Shipped with USPS Priority Mail. ( BOX VERDE 14 ). Antec Basiq 350 Watt ATX Power Supply BP350 - AM. Condition is Used. Shipped with USPS Priority Mail. Manufacturers' Model Number: BP350P. If there are any problems, we are unable to follow up on progress because it has not been sent on our account, this will be down to you. Rest of the World. s (Subject to Clearance). Shipped with USPS Priority Mail. Great condition. Model BP350. This is a previously owned item in used condition. Item is sold AS IS in untested condition, possibly only good for parts. Antec, Basiq Power Supply, BP350, Silver, $39.99, For parts or not working, Missing Original Packaging. Powers On. Needs New Fan. 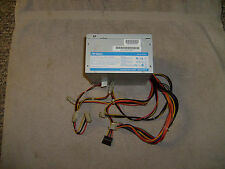 Accessories Not Included., ATX12V Version 2.01 compliant, SK-003Q3F-001, 001910340354, 0211131847468. Model: BP350. Output: 350W MAX. Used unit, good condition, it is good working. Local pick up free. See pictures. Parts are sold AS IS.